We’d love your help. Let us know what’s wrong with this preview of Dark City Lights by Lawrence Block. To ask other readers questions about Dark City Lights, please sign up. Dark City Lights is a book of short stories with NYC as the common theme. Some are from the past as well as one from the future. There are 23 stories contained in the book, the longest at 38 pages, the shortest comes in at 4 pages. Many of the stories happen to be my first exposures to their author's writing. It was a perfect book to carry around for a few days, casually reading while waiting for appoi I received a free copy of this book from Goodreads First Reads in exchange for an honest review. I did particularly enjoy The Dead Client by Parnell Hall, Jimmy Takes A Trip by Elaine Kagan, The Lady Upstairs by Jill D. Block, Old Hands by Erin Mitchell, and The Tour Guide by Kat Georges. The standouts for me were Chloe by Jerrold Mundis and Keller The Dogkiller by Lawrence Block. But, come on, Lawrence Block was gonna ace my review anyways.... A Walk Among The Tombstones was an awesome book and I am already a fan! I would give it 3.5 stars overall, because some of the stories I found just plain strange or just too short to my liking. I would recommend this book for crime story lovers. If you just like light, easy to read essays, this would be a good choice as well. 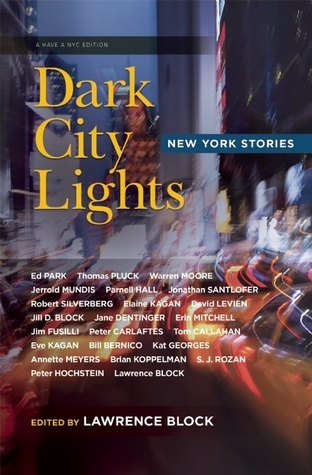 Dark City Lights is a compilation of 23 short stories based on New York City with lots of diversity between the authors. The stories range from every day events that you might find in New York to the strange and bizarre like alien invasions and goddesses. There is a little bit of everything that will appeal to everyone. I like reading anthologies because you get introduced to many different authors and you get a variety of styles. I also like the short stories to pass time between appointments an Dark City Lights is a compilation of 23 short stories based on New York City with lots of diversity between the authors. The stories range from every day events that you might find in New York to the strange and bizarre like alien invasions and goddesses. There is a little bit of everything that will appeal to everyone. I like reading anthologies because you get introduced to many different authors and you get a variety of styles. I also like the short stories to pass time between appointments and errands without the risk of reading until all hours of the night and not accomplishing anything. Some of the stories range from a couple pages to upwards of 20. I admit that I’m bias and liked Lawrence Block’s story Keller the Dogkiller the best. But I really like Lawrence’s stories and this was just as good. I loved how his assassin gets himself out of a strange situation. Plus Lawrence does a great job selecting all of these stories for this collection. I admit some of the stories were better than others, but that is what you get with an anthology. The best part is I got to learn of new authors that I’m going to check out more of there work. Over all this is a great compilation. If you like stories based on New York this would be a great book for you. Lawrence Block has brought together quite a collection of short stories in this work. Many of the stories had me wishing the short story had been longer. Block features a variety of styles in the book and there should be something that appeals to practically everyone in the collection. I received this copy through the Goodreads Firstread program and it was good to read and see New York City in many different lights. So yea, I hated some of those stories and loved others. Just a mix of eclectic backgrounds and characters. The shortest story on there by Warren Moore was the one that has still stuck with me. Besides Block's story which is bound to be a good setup Moore's was my favorite. Just a good opening to other authors to check out. A great collection of short stories. Only a few are hard to understand, most are really meaningful and fun to ponder over. I really am glad to have won this book here on Goodreads. Ill be keeping this to read stories again. A good collection of NYC based short stories. A collection of short stories set in New York city. Of rather uneven quality, some exceptional and some forgettable. The problem is that, as a whole, rather than noir they just seem to be dreary.